Welcome to Knit Bin's own brand of high quality jumbo knitting needles! These beautiful needles are made of Sheesham wood (also known as Indian Rosewood) and of Bakain wood (a member of the mahogany family and known by various names including chinaberry, Persian lilac, and Indian lilac). Mondos have an excellent finish and good points. The joins are smooth and the strong cables are flexible. And, as always, wood needles are warm to the touch so they're easier on the hands. If you're looking for a great tool to use on those big needle projects, this is it! 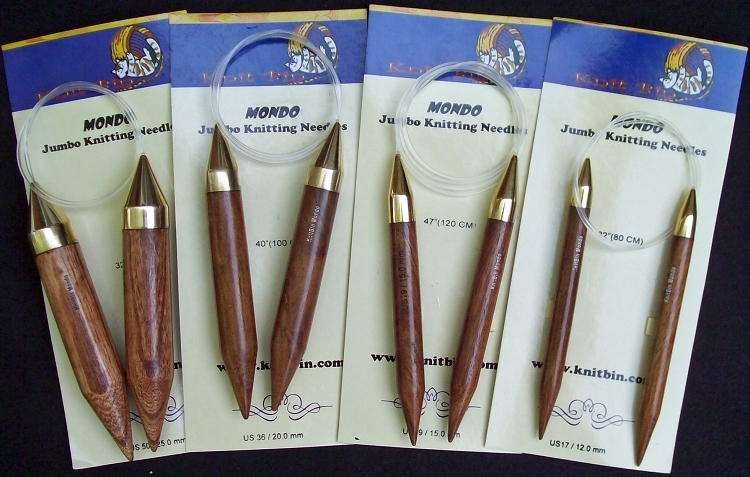 Just received my size 50 47" Mondo circular knitting needles in rosewood. These are the most gorgeous knitting needles I have ever owned. They are a beautiful, deep hue and have a wonderful heft. I suspect that they will be a bit awkward to work with, because they are so fat. But I am thrilled with their quality. This coat project (3 stitches = 4") is going to be fun and beautiful.